Every year horror fans gather for the Days of the Dead convention, a place where they can commune, covered in corn syrup, while enjoying indie horror films, buying genre kitsch and meeting their favorite movie monsters and scream queens. Beginning in February, the convention tours through Indianapolis, Chicago, Atlanta and Los Angeles, giving fans plenty of chances to participate in the blood spattered revelry. But it’s not all murder and mayhem. For the artistic and entrepreneurial horror fan, a convention like Days of the Dead holds a wealth of marketing and networking possibilities. Chris Pezzano is decked out in elaborate zombie makeup, gory appliances and tattered clothes, standing behind a booth against a back wall in the middle of a row of vendors. The vendors’ section takes up nearly half of the space allotted the Days of the Dead convention, located in the bottom floor of the Atlanta Sheraton. Most vendors are hawking eclectic horror T-shirts and movie-monster action figures, but Pezzano’s booth, a table filled with large, gruesome, handmade baby dolls stands out among the kitsch. It doesn’t hurt that Pezzano looks more like a convention goer than the typical schlubby salesman. Pezzano has made a niche for himself selling spooky figures, jewelry and weaponry online and at horror conventions, primarily the Days of the Dead and Full Moon conventions. The Huntsville, Ala.-based Pezzano uses conventions as an opportunity to network. His booth is filled with cards simultaneously advertising his makeup effects and the work of his photographer. The gambit seems to have paid off, since Pezzano stays busy. But Pezzano isn’t the only artist that’s found success with this strategy. Getting people to just see your work is half the battle and the heavy traffic at a convention like Days of the Dead can be just the right match for creepy artists. If the right person takes notice, your art might be hanging from Daryl Dixon’s neck too. But it’s not just the vendors that take advantage of conventions. Even the guests signing the autographs use them as a chance to network. Rose started her career at 12 years old, when she landed the lead role for the cult horror film, ‘Sleepaway Camp.’ Now, 30 years later, she is the co-head of the Independent Genre Division at Carolco Pictures, her IMDB page boasts over 50 acting credits and seven producer credits. Having done a variety of large-to-micro budget films, Rose is a seasoned cinema veteran. But her heart belongs to indie filmmaking. Nick Principe, the slasher star of the ‘Laid to Rest’ franchise, has worked several jobs in horror show business, working behind the scenes on television shows, to donning masks and chasing damsels. His story sounds a lot like the others. He just showed up and put himself out there. Not everyone will luck into a crew filming at the church across the street, but there are some other options. 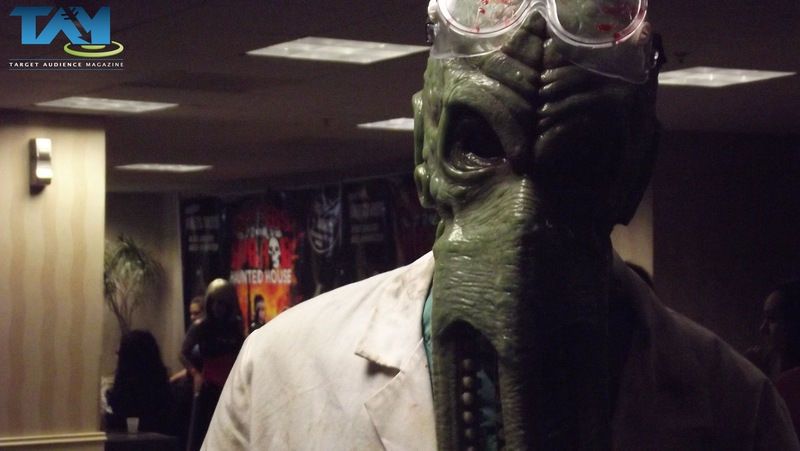 Conventions like Days of the Dead aren’t just fun gatherings for fans. It’s not just a horror thing, or a nerd thing; it’s a movie thing and a business thing. There are some real opportunities to be capitalized on for those that are savvy enough to take advantage of them. So for those creative and business-minded horror fans out there: show up and show off your craft. There are few places where you can guarantee that you’ll be able to put your work in front of so many genre fans and insiders at once.